Beer is a natural product that contains, and is hugely influenced by, a host of living micro-organisms. (That’s the yeast!) This living beer will continue to develop over time. Sometimes the changes are welcome, sometimes less so. How you store beer can have an effect on this. So, it’s worth knowing how to store beer so it’s at its best when you want to drink it. The main enemies of good beer are heat and light. This is especially true for hoppy beers. Exposure to light causes chemical changes in the beer that introduce the ‘light struck’ or ‘skunky’ aroma. (More on that in another post.) This is why cans and brown glass bottles are better than green bottles, and why clear bottles are a terrible idea. It’s also a good idea to store beer away from anything damp, to protect its cap or cork. When you store beer, be it in a cellar, in a cupboard, or just in a box in a dark corner somewhere, it pays to look out for any nearby sources of heat. If it’s close to a furnace or a water heater, it’s worth looking for another spot. It’s easy to fall into thinking of refrigerators or freezers as cold things, but remember that these produce heat too. If they’re cold inside, all the heat has to go somewhere, right? So where’s the best place to store beer? The best place to store beer is in a cool area, away from direct sunlight, sources of heat, and in a constant temperature. Sounds like a fridge, right? A fridge can indeed be an excellent place to store beer, but you need to keep a couple of things in mind. First of all, it’s not a long-term option. Refrigerators are designed to keep food dry. For beer sealed with a cork, dehydration can become an issue. If you want to keep a corked beer around for a while, perhaps to age it, then a cellar would be a better option than the fridge. The moderate humidity levels will be more appropriate, as will the slightly warmer temperature. Also, bottle-conditioned beers can suffer if they are kept too long in the fridge. The low temperature will slow or stop the fermentation process, and the beer’s flavour will be compromised. The beer can also become cloudy and flat. Second, keep in mind the recommended serving temperature for your beer. Often this will be quite a bit warmer than your fridge. It’s not a huge problem though. Just take your beer out of the fridge ahead of time, and allow some time for it to warm up until it reaches the right temperature. Oxygen is another potentially bad influence. In light-bodied beers, particularly lagers, oxidisation will produce stale off-notes likened to paper or wet-cardboard. 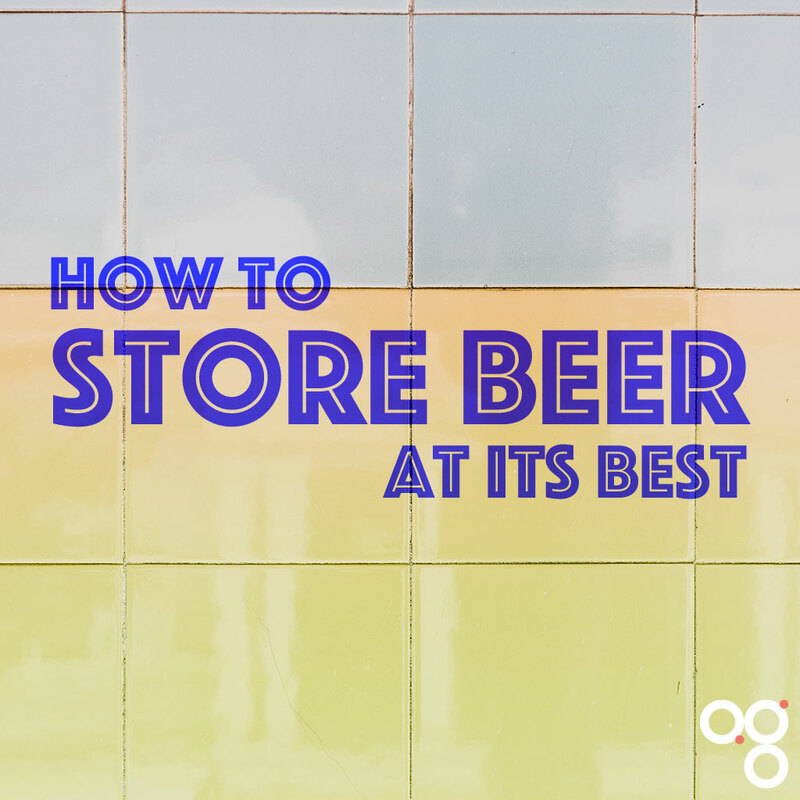 If you want to store beer, it’s worth keeping this in mind. Whether your beer has a bottle or a cap, it will benefit from being stored upright. And it’s true for cans too. Oxidisation is one of the main reasons for this. If you store beer on its side, the surface area that comes into contact with the air within the bottle is increased, and so is the potential for oxidisation. By storing beer upright you minimise this risk. It’s also a good idea to store beer upright if it is bottle conditioned. Dead yeast collects over time in bottle conditioned beers. Ideally you want this yeast to collect at the bottom of the bottle instead of the side. Yeast that has collected on the side of the bottle is more susceptible to agitation when the bottle is moved or poured, so you have less control over whether you pour this beer into your glass or not. Dead yeast can give beer an off flavour, so letting it settle out is a good idea. If your beer has been pasteurised then it is effectively dead. Its taste and aroma are not really going to change, and you don’t particularly have to worry about drinking it fresh or how it’s stored. Once you’ve opened your beer, you need to drink it as soon as possible. At this point your only real storage option is your stomach. Newer Post Chiltern Brewery, Three Hundreds Dark Old Ale	Older Post Do you know your beer’s recommended serving temperature?